VIDEO: A trip on the..
Melbourne’s newest ferry has been put through its paces before it officially launches on Monday. And 3AW Mornings was there to capture it. Click PLAY below to jump in the boat and take a ride! 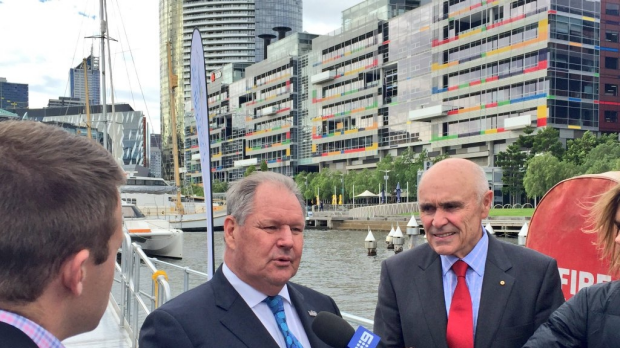 The brainchild of leading businessman Paul Little, the 35-metre catamaran can carry up to 400 passengers and will travel between Werribee South and Victoria Harbour. It’s hoped it will help ease congestion and provide a new form of transport to the city for residents in Melbourne’s west. Essendon coach John Worsfold and Lord Mayor Robert Doyle were among the passengers on board during Thursday’s trial, with Cr Doyle labelling the trek an absolute success. ‘I think Melbourne will embrace it,’ he said.